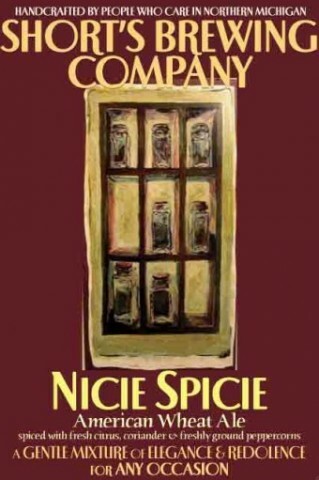 The Nicie Spice label is something between Cezanne and Munch, making a spice rack expressionist. The use of the maroon background brings out some of the red tones in the image itself. The thick strokes and ambiguous light source almost makes it seem threatening. 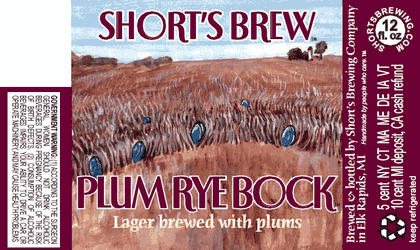 The "gentle mixture of elegance and redolence" is characteristic pretty words by Short's. 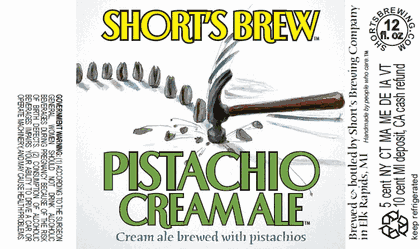 The pistachio Cream Ale label is less artsy, but it's just clever, using a light color palette against the picture of a hammer to connote a sense of smoothness and powerful taste. 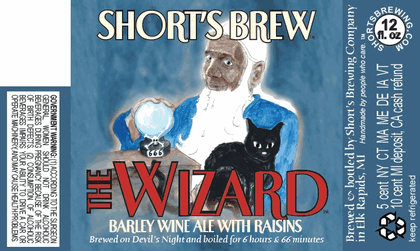 I wish the image quality were a little better, but this is what I can find (as always, the Beersage at www.beernews.org comes through). Anyway, talk about rich, bold colors. 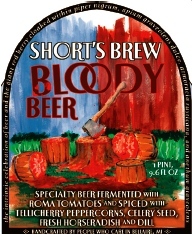 It's not quite the label we'll see later, but you can tell just from the use of the axe and "blood" that Short's is okay pushing the envelope with label art. Even leaving aside the grisly nature, does a bunch of hacked up tomatoes put you in a drinking mood? 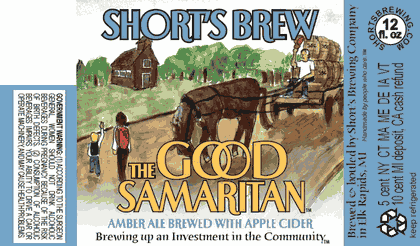 The story of the good Samaritan is a bit more adult than this children's book label art, but I still like the use of Biblical inspiration for beer (side note: check out Thank Heaven for Beer. Go, do it now. Yeah, I was a Religious Studies major once upon a time. Okay, back to this). Also, I'm a fan of anything that "brews up an Investment in the Community." That's just creepy, but, like the Samaritan label, more of the Le petite prince style that I wrote about Short's previously. This one can't escape Van Gogh, which will happen when you do fields of grain. The little plum things look creepily like eggs or cocoons or something, but we've got context thanks to enormous instances of the word "plum." 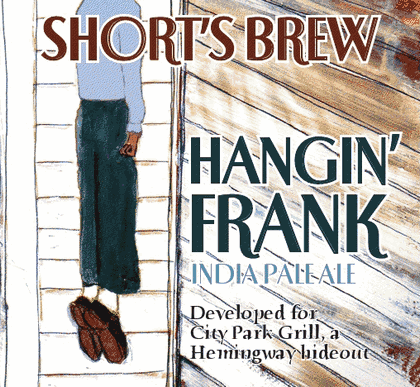 The Short's collaboration with Half-Acre is a guava IPA, which I really wish I could taste out here in PA. The art's different, clearly, but the sickly green color of the water is awesome, and the comic book style of the art works in a Toxic Avenger/Ugly Kid Joe kind of way. You know, with a little bit of Washington Crossing the Delaware. As the Beersage said first, I was more than a little surprised the TTB, which approves all labels, was okay with this, since they have a bit of a penchant for rejecting controversial things. 2) The hand came out darker than intended, and has now been revised to be obviously caucasian. There's no racial reference or Without Sanctuary stuff going on here. Okay, so it's not as provocative a piece as it appears to be. When I first saw it, I thought it was a bit edgy, but the possibility of it being widely offensive did not strike me as likely. Still, the image of a person hanging on a bottle of beer makes slashed tomatoes look like an ad for Bud Light Lime. We talk about masculine label art for big, hoppy beers occasionally being a turnoff to beer newbies, but this isn't aggressive so much as discomforting. Look, I admire Short's for doing interesting things with their art. If no brewery did it, I'd have nothing to write about. But I think there's a lesson here that you need a very loyal or highbrow clientele to do consistently challenging stuff without just turning them off. If I go into a beer store and see the wall of labels, I'll try this because I'm into interesting art and it's an IPA I haven't had. But I'm not bringing it to a party with anyone who's not into craft beer. Craft beer has a hard enough time getting accepted in some circles, and label art like this can be both part of the reason for that, and part of the remedy. I suppose one question is the level of distribution; if this is mostly a local effort, people may be familiar with the story, brewery, or both, and so there's some leniency. 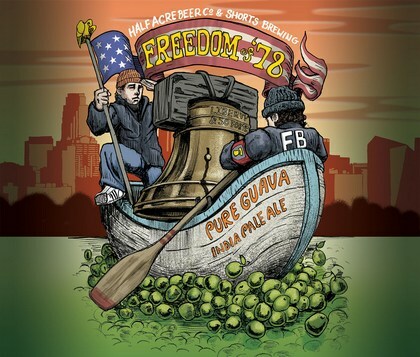 But when this label art shows up on Beernews.org and everyone nationwide gets a look, you run into a situation where something a little sensitive and potentially for a limited audience now is looked at through many different sets of eyes. One of the things I love about art is that, like craft beer, everyone experiences it differently. We bring our experiences, memories, associations and even sensations (we see colors and taste tastes differently on a basic physiological level) to an experience. And I for one commend Short's on creating label art that makes me feel something, even if that emotion is one of discomfort. Yes, at some level, your art also has to sell beer, and no beer with a label that evokes that type or intensity of emotion can reliably sell itself to a wide audience. But just as not all art is designed to be widely palatable, not all beer art needs to sell 6 million barrels, and when your audience is small, knowledgeable, and local, you may as well do something interesting.